The website of Journal of Emergencies, Trauma, and Shock aims to make the printed version of the journal available to the scientific community on the web. The site is purely for educational purpose of the medical community. The site does not cater to the needs of individual patients and is designed to support, not replace, the relationship that exists between a patient/site visitor and his/her existing physician. The entire contents of the Journal of Emergencies, Trauma, and Shock are protected under Indian and international copyrights. The Journal, however, grants to all users a free, irrevocable, worldwide, perpetual right of access to, and a license to copy, use, distribute, perform and display the work publicly and to make and distribute derivative works in any digital medium for any reasonable non-commercial purpose, subject to proper attribution of authorship and ownership of the rights. The journal also grants the right to make small numbers of printed copies for their personal non-commercial use. LOCKSS system has permission to collect, preserve, and serve this open access Archival Unit. Neither the Journal of Emergencies, Trauma, and Shock nor its publishers nor anyone else involved in creating, producing or delivering the Journal of Emergencies, Trauma, and Shock (in printed, web or CD format) or the materials contained therein, assumes any liability or responsibility for the accuracy, completeness, or usefulness of any information provided in the Journal of Emergencies, Trauma, and Shock (in printed, web or CD format), nor shall they be liable for any direct, indirect, incidental, special, consequential or punitive damages arising out of the use of the Journal of Emergencies, Trauma, and Shock. All material published in the Journal of Emergencies, Trauma, and Shock undergoes peer review to ensure fair balance, objectivity, independence, and relevance to educational need. The editors of the material have consulted sources believed to be reliable in their efforts to provide information that is in accord with the standards accepted at the time of posting. However, in view of the possibility of error by the authors, editors, or publishers of the works contained in the Journal of Emergencies, Trauma, and Shock, neither the Journal of Emergencies, Trauma, and Shock, nor its publishers, nor any other party involved in the preparation of material contained in the Journal of Emergencies, Trauma, and Shock represents or warrants that the information contained herein is in every respect accurate or complete, and they are not responsible for any errors or omissions or for the results obtained from the use of such material. Readers are encouraged to confirm the information contained herein with other sources. Patients and consumers reading articles posted on the website of the Journal of Emergencies, Trauma, and Shock should review the information carefully with their professional healthcare provider. The information is not intended to replace medical advice offered by the physicians. 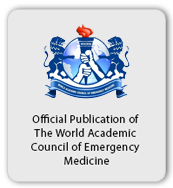 The Journal of Emergencies, Trauma, and Shock and its publishers make no representations or warranties with respect to any treatment, action, or application of medication or preparation by any person following the information offered or provided within or through the Journal of Emergencies, Trauma, and Shock. The Journal of Emergencies, Trauma, and Shock, and its publishers will not be liable for any direct, indirect, consequential, special, exemplary, or other damages arising therefrom. The advertisers who purchase Banners on the Journal of Emergencies, Trauma, and Shock have no influence on editorial content or presentation. Moreover, the posting of particular Banners does not imply endorsement by the Journal of Emergencies, Trauma, and Shock or its Editors. You agree to hold harmless and indemnify the Journal of Emergencies, Trauma, and Shock , its publishers, the Editors and their agents, and the contributors to the Journal of Emergencies, Trauma, and Shock, against any liability for any claims and expenses, including reasonable attorney's fees, relating to any violation of the terms of this Agreement or arising out of any materials submitted by you. This Agreement shall be governed by the laws of India applicable to agreements wholly made and performed in India without regard to its conflict of laws principle. Before seeking legal recourse for any harm you believe you have suffered from your access to the Journal of Emergencies, Trauma, and Shock, you will give the Journal of Emergencies, Trauma, and Shock written notice specifying the harm and 30 days to cure the harm after providing such notice. In the event that you believe you have been irreparably harmed by any cause of action relating to the Journal of Emergencies, Trauma, and Shock, you agree to inform the Journal of Emergencies, Trauma, and Shock in writing and grant the Journal of Emergencies, Trauma, and Shock thirty (30) days to cure the harm before initiating any action. Any legal action, suit or proceeding arising out of or relating to this Agreement or a breach thereof, shall be instituted in a court of competent jurisdiction in Mumbai city, and you hereby consent and submit to personal jurisdiction of such court, waive any objection to venue in such court and consent to service of process at your last known address. Any cause of action initiated by you must be initiated within one (1) year after the claim or cause of action has arisen or it will be barred. You agree that this agreement and the terms and conditions hereof, including all disclaimers set forth herein, shall inure to the benefit of the editors and their agents, and the contributors to Journal of Emergencies, Trauma, and Shock, as third party beneficiaries hereto, to the same extent that this agreement inures to the benefit of Journal of Emergencies, Trauma, and Shock. Journal of Emergencies, Trauma, and Shock reserves the right, at its sole discretion, to change the terms and conditions of this agreement from time to time and your access of Journal of Emergencies, Trauma, and Shock will be deemed to be your acceptance of and agreement to any changed terms and conditions. Journal of Emergencies, Trauma, and Shock may contain links to web sites operated by other parties. These links are provided purely as educational purpose. Such links do not imply Journal of Emergencies, Trauma, and Shock 's endorsement of material on any other site and Journal of Emergencies, Trauma, and Shock disclaims all liability with regard to your access of such linked web sites.